I am so excited to welcome you to our sixth Metal Heroes Summer Camp. We are returning to the amazing Slide Mountain Forest House Resort and we are working on making 2019 camp the loudest, funnest and the best Metal Heroes camp, yet! Outside of our amazing rehearsals, guests, jams and much more, we are turning up the volume up a notch! Metal Heroes Summer Camp is designed to teach, motivate and inspire young metal-heads ages 14-21. All rock band instruments are welcome focusing on Guitar, Bass, Drums and Vocals. I hope you will join me on this 100% full-on metal journey. I have always wanted to share the lessons from my tour and music experiences with younger metal-heads and I’m really looking forward to open up the metal vault with you on so many levels and help you sharpen your skills to metal ninja perfection. While helping you with individual tasks, we’ll also learn how to make amazing progress when rehearsing with a band to talking about any musical challenges that you might face. As always, new workshops greet us this year. I'm personally really excited for The Foundry - a songwritting workshop where you will learn how to write, craft and arrange your own songs and riffs. I can guarantee this will be incredibly fun and you will learn a lot, too. You also will get some great inside info on how the music business works, how to work well with others, all the while you fully immerse yourself in the music of the metal gods. We’ll be jamming together, hanging out together and everyone will get a chance to ask their questions and get plenty of one-on-one playing tips. Continuing the tradition of great, inspiring visiting music mentors and industry pros, we have some very special guests in tow this year. You will not want to miss this. And, of course, get ready to hear countless tour stories which more than likely involve your favorite rockers. We’ll close out the camp with a superb metal concert in front of your family and friends that will feature classic as well as current metal anthems. So, if spending nearly a week at a beautiful resort like location while immersing yourself in all things metal sounds good to you – then let’s rock! This is for you. Have a Question - CONTACT US! Located at 805 Oliverea Road, Oliverea/Big Indian, NY 12410. Our camp location is down the road from the Full Moon Resort, Big Indian, NY. CHECK OUT OUR 2018 CAMP SCHEDULE! Tuning Your Mind To D is one of Metal Mike's favorite messages to the campers as recorded and narrated by Mike's good friend, C.J. - The Metal Motivator. Topics of this 30 minute message include Dreams, Desires, Drive, Determination, Diligence and Discipline as the needed tools to develop further as a musician and person. Brief discussion will follow with Mike to talk about the points in C.J. 's message. We can not think of a better opening to the camp than this segment that is sure to inspire the young rockers to do their best during the week and will arm them with great info to draw on in time to come. This is an interactive workshop where Mike digs deep into various aspects of guitar playing and presents awesome idea on the guitar. From tips on guitar pick selection to riff building to dexterity exercises to tricks on getting a perfect heavy metal guitar tone, this workshop will present a lot of super useful information. Campers will have a chance to ask questions while getting plenty of one on one attention to focus on any aspect of guitar playing they would like to additionally discuss. Mike's guitar workshop is always a great time and a superb way to learn something new on the guitar. In this very informative workshop, Metal Mike will dive into many aspects of what is necessary to become an engaging live performer. While many young musicians spend plenty of time perfecting their instrument; performing live on stage and in front of lots of people is often an intimidating task. Drawing from his experience of playing in front of as many as 350,000 people, Mike will discuss many aspects of live performance including preparation, diet, sleep, clothing, keeping time, instruments, connecting with the audience and a lot more. Foundry: A factory where metals are cast into shapes. While heavy metal anthems will never die, the blood of the next generation of heavy metal lies in new music. This year, we are bringing back this super popular workshop that the campers loved. We are taking a fun and sometimes scary turn from playing covers to having hands on experience in learning how to compose, arrange and perform your own music. This fun and hands on workshop is a must have in the arsenal of any aspiring metalhead. Metal Mike will lead each session while teaching and helping campers write their own music. Selections will be performed at the final show in front of family and friends. Every guitarist and bass player should know how to perform basic maintenance on their instrument. While professional guitarists do have "guitar techs" who take care most of the needs, it is hard to master an instrument unless you know the basic innerworkings of it. Mike will perform a string change with all of the pro tips included plus will cover additional topics such as: workboxes, graphite lube, 3 step guitar finish process, Floyd Rose set-up, Gaffers tape, guitar cables and more. Known for his stellar work with New Jersey thrash masters Overkill and hailed as one of metal's most solid drummers; Ron will present the campers with a fantastic workshop that will leave the young metalheads inspired and armed with a ton of information. Ron will share his tour experiences, playing examples and will talk in-deep about what it takes to be a high-performing drummer in a professional setting. Not to be missed. We are excited to have Ron with us this year for this very special clinic. This workshop, as all workshops, is open to all campers. A visit from Wayne and Jamie is always a camp favorite. From running their own popular mailorder website to developing their own guitar accessories; these two hard working young entrepreneurs know all things guitar. And, they are happy to share what they know! They will concentrate on showing the campers how to easily modify their instruments in order to improve tone, appearance and playability. Always bringing a wealth of information for the young campers, Wayne & Jamie are great guests to have onboard. We are looking forward to having them again for an awesome workshop. Welcome to the part of the camp where the campers will draw tickets in order to snag some awesome items. Some giveaways include T-shirts, stickers, strings and guitar straps from several companies that Mike works with. Some items are seriously awesome awesome one-offs. Good luck! Campers will have a chance once again to stretch their memory skills and answer some well thought out metal trivia questions. Correct and best answers will be awarded with small prizes in the forms of T-shirts, tuners, picks and more. This fun camp activity is presented by none other than the Hall of Heavy Metal History who inducted Lzzy Hale, Bill Ward, Billy Sheehan and yes, Metal Mike in 2018. In this super fun segment, Metal Mike & staff will present our Power Chord Awards to the campers who have been on their Metal Heroes Summer Camp journey with us for the entire 5 years. We appreciate their dedication, travel and support. In short we want to say "thanks" to them and their parents. Ready To Rock? Join Us! Your Metal Heroes Summer Camp Tuition is All-Inclusive! • All Metal Heroes Summer Camp Classes, Workshops, Jam Sessions and Equipment Usage in Air Conditioned Environment. • Shared Accommodations in B&B Style Chalets with Private Bathrooms, Air Conditioning and Linen Service. • REGISTRATIONS: $1399 Registration Rate Applies to all Registrations Received. • SPECTATOR PACKAGE: $645 Spectator packages are available to accompany full Metal Heroes Summer Camp participants. Spectators are welcome to enjoy all that the Slide Mountain Forest House Resort has to offer (swimming, hiking, tennis, etc.) and includes all meals and shared accommodations with your Metal Heroes participant. INDIVIDUAL GUITAR LESSONS: Private guitar lessons are available with Metal Mike for an additional fee of $50 per 30 minutes. Mike can only do a few per camp. Let us know if you want one for your metalhead. REGISTRATION TERMS AND CONDITIONS: Your decision to register for Metal Heroes Summer Camp constitutes your acknowledgement of and consent to all of the registration, payment and cancellation terms and conditions listed below. • Rates are Subject to 7% New Jersey State Tax. • Upon registration, a $150 deposit per participant will be charged. Spectator deposits are $50. • You'll be responsible for the remaining balance due by 5/25/18. • Registrations received after 5/25/18 must be paid in full at the time of registration. • All payments and deposits are non-refundable. • Cancellations received on or before 5/25/18 will not be charged the remaining balance. • Cancellations received after 5/25/18 will be charged the full remaining balance. Due to the nature of our events and strict cancellation policies, Chlasciak Metal Music Entertainment, LLC strongly suggests purchasing travel insurance. Children under the age of 13 are recommended to attend with a guardian. PRE-REGISTER TODAY - CLICK HERE! Metal Mike’s focused, no frills metal guitar playing took him from 350,000 people at Rock In Rio to Ozzfest to three times at New York City's Madison Square Garden. Metal Mike is a metal recording and touring artist, writer, blogger and an expert heavy metal guitar coach. Mike has recorded and toured the world several times over with Heavy Metal's elite, has appeared on albums totaling well over a million sold, and is a long standing guitarist to Judas Priest's Rob Halford in the Metal God’s solo endeavor Halford. Metal Mike has also taught hundreds of thousands of people internationally via his wildly popular 'Metal For Life' Guitar World column, DVDs, books, music camps and workshops. Mike has recorded and/or performed with Bruce Dickinson of Iron Maiden, Axl Rose of Guns N' Roses, Sebastian Bach, Testament, Rudolf Schenker of Scorpions, Geoff Tate of Queensryche and Saturday Night Live's Jim Breuer. Mike tours internationally as a solo artist, with other metal gods, and has played in over 20+ countries while sharing tours with bands such as Motley Crue, Iron Maiden, Guns N' Roses and Ozzy Osbourne. Mike has penned guitar instructional books and metal guitar instructional DVDs available internationally through Alfred Music Publishing. Mike has been recently taking part in the Randy Rhoads Remembered tribute shows in coordination with the Rhoads family, the Axes & Anchors guitar cruise along Yngwie Malmsteen, Zakk Wylde and Marty Friedman among others and has been voted ‘Top 10 Metal Guitarist’ by Europe’s Thrash ‘Em All Magazine. 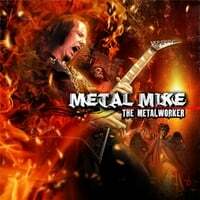 Mike’s latest solo release is The Metalworker. In 2017, Legacy/Sony Music has released the Rob Halford - The Complete Albums Collection box set. Mike's real world experience is built on the pillars of formal music education. Metal Mike is a scholarship graduate of the famed Berklee College of Music in Boston, Ma. In 2018, Metal Mike has been inducted into the Hall of Heavy Metal History along side Lzzy Hale (Halestorm), Bill Ward (Black Sabbath), Billy Sheehan (Mr. Big, Talas, David Lee Roth) and other iconic metal musicians and industry influencers.